I heard on the radio this morning that 78% of Americans grill on Memorial Day. Keith Todd on 105.7 out of Statesville, NC shared that little tidbit. He also said that steak was the top pick for grilling followed by hamburgers. 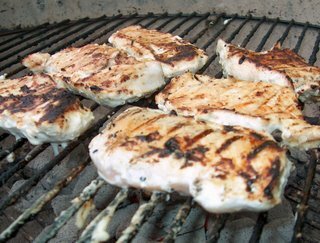 If you're firing up the grill today, then you ought to check out my Grill Web Site. I've been working my space for close a year now and have a good collection of recipes, tips, and product information. It may be a little late to pick up a chimney starter, but that's my top pick of the grilling accessories for the year (if your're using charocal). You would not believe what a difference it makes in getting charcoal or wood chips started. I'd considered getting one for quite a while. After I did, I kicked myself for waiting so long. Now, I need to decide what we want to toss on the grill. Decisions. Decisions.